Several initiatives to improve learning through mobile technologies were presented during the Mobile Learning Week 2017, a recently-concluded five-day event held at the Paris headquarters of the United Nations Educational, Scientific and Cultural Organization (UNESCO). While smartphone apps and interactive workshops demonstrated how mobile solutions could meet some of the challenges faced by displaced people, two tents set up by the Office of the UN High Commissioner for Refugees (UNHCR) at the event facility gave participants an idea of the living and learning conditions faced by refugees, including the lack of Internet connection. “While refugee learners face numerous obstacles, they also carry the potential to transform educational practices,” the Congolese university student and youth community activist Roland Kalamo told UNESCO. He lives and studies at Kakuma refugee camp in Kenya, and was one of the presenters at the event. Mr. Kalamo is also the founder of Movement of Youth for Peace and Change, an organization that teaches young people at Kakuma about human rights, peacebuilding and conflict resolution through arts like cinema and music, language, journalism and sports. Through his organization, he seeks to empower the youth to be part of the solutions to their own problems. 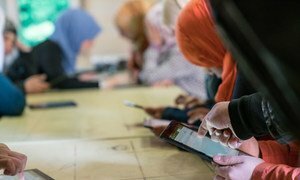 Although lack or unstable Internet connection can be one of the multiple obstacles to refugee learners, mobile learning – which enables, through mobile technology, learning anytime and anywhere – can be an opportunity for them to invest in their own lives and future. According a report from UNHCR – which co-organized the event together with UNESCO and the International Telecommunication Union (ITU) – only 50 per cent of refugee children have access to primary education, while the global average is of more than 90 per cent. As these children grow older, there is an even larger gap: only 22 per cent of refugee adolescents attend secondary school compared to a global average of 84 per cent. At the higher education level, just 1 per cent of refugees attend university, compared to a global average of 34 per cent. Education experts and government officials will gather at the Paris headquarters of the United Nations Educational, Scientific and Cultural Organization (UNESCO) from 20 to 24 March, to discuss ways of expanding the use of mobile technologies to “reach people where they are” and improve education opportunities for refugees and displaced persons and others in emergency situations.